Cyclists in the City: Kings Cross & HGV deaths. TfL suggests trixi mirrors and bike stop boxes - Dutch road safety institute suggests these solutions should be rejected. Why can't TfL implement real solution NOW? Kings Cross & HGV deaths. TfL suggests trixi mirrors and bike stop boxes - Dutch road safety institute suggests these solutions should be rejected. Why can't TfL implement real solution NOW? 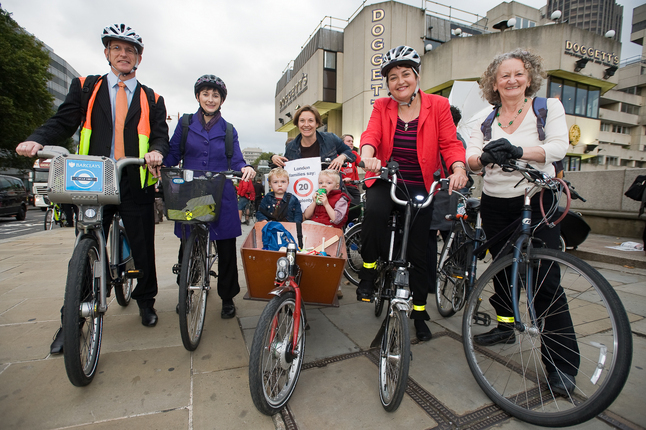 Last week, LibDem London Assembly Member Caroline Pidgeon popped up on ITV news. She has been pushing Whitehall to change the rules and allow Transport for London to put ‘trixi’ mirrors on more junctions. These are the mirrors that allow HGV drivers to more easily see people on bikes around them. Caroline Pidgeon strikes me as someone who ‘gets’ cycling. A year ago, she quite rightly slammed Boris Johnson’s mayoral pledge to ‘smooth the traffic flow’ saying that he was prioritising speed for car drivers at the expense of inconveniencing and endangering everyone else. However, I can’t help but think that trixi mirrors are just sticking plaster. Holland's Institute for Road Safety Research published a report last week showing that when these mirrors were introduced, there was a small decrease in HGV drivers colliding with cyclists but this was due largely to promotional activity. In 2008, the Institute ran an extensive study into these mirrors and concluded: "The visual field is still insufficient...Truck drivers do not make the best possible use of the different mirrors [and] Cyclists insufficiently take account of the fact that trucks have a limited visual field." The Dutch Institute concludes: "The ultimate solution for the blind spot problem is a structural separation of trucks and cyclists." This is exactly NOT what Transport for London proposes at Kings Cross. It has told Camden Cyclists (the hyper-active team that got you the proper Dutch-style bike lanes along Torrington Place. You know, the one that turns into a car park as soon as you enter Westminster's roads) that the creation of a cycle lane here 'would cause delays for road users'. Several cyclists have been killed at Kings Cross. As local resident Caroline Russell points out, the father of a friend was killed cycling here by an HGV in exactly the same spot as Deep Lee. Several more people pedestrians and cyclists - have been killed here in recent years. TfL is belatedly proposing to review the junction and make it safer for cycling. 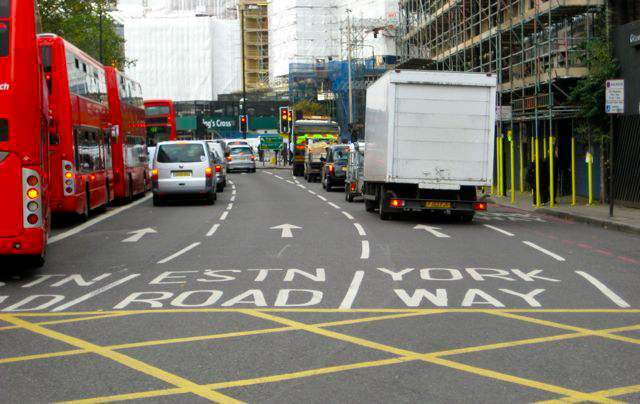 It claims "the study will consider how all road users, especially vulnerable road users such as pedestrians and cyclists, travel along the TfL and local borough road network around Kings Cross." TfL will also review whether it's possible to remove the whole gyratory system around Kings Cross. In reality, though, that review is at least a year off and no-one has any idea if anything might actually happen here. Aldgate gyratory was 'reviewed' five years ago with a mind to removing the gyratory. A couple of months ago, the City of London told me that TfL has announced another review of Aldgate next year. Nothing's happened in seven years. So why believe TfL at Kings Cross? In the meantime, TfL's proposal? Some advance stop boxes for cyclists and some trixi mirrors. You can read about the proposals and a very good critique of the scheme that TfL is going ahead with on Camden Cyclists’ site here. Essentially, the 'improvements' won't make things any easier or safer for cycling here. They are largely cosmetic changes and include all the things the Dutch rejected back in 1980 because they weren't good enough for the job. What's so galling is that there are routes all around Kings Cross that would allow cyclists to avoid much of the junction by implementing two-way working of one-way streets, some cyclist traffic lights to get through some of the hairy parts and decent signage. Has TfL considered them? No. Could they be implemented within a few months? Yes. Will anything happen? No. Why not? TfL has the Olympics to worry about. Everything is already set in stone for 2012. A few more deaths won't matter. Camden Cyclists is pushing for proper, Dutch-quality cycle infrastructure through this junction. And I support them. But they also recognise that - given it may be 10 years before TfL pulls its finger out - the opportunity to create alternative routes around the horrible gyratory is a possible interim solution. Frankly, I think Camden Cyclists are being incredibly pragmatic, flexible and just want to get things done. They're faced with a Mayor and with TfL who are starting to make at least some of the right noises but are promising jam tomorrow without even offering bread today. It's a pretty poor sales pitch, in my view.